Since I've been back from Vogue Knitting Live! in New York, I've had a lot going on with work and life. That, however, does not give me any reason to not give you updates on what I bought, what I learned and what I did! Today I'll start with my classes. Since Vogue Knitting Live! will be in Chicago (downtown at the Palmer House Hilton!!! ), I bet most of these same teachers will be there teaching similar classes. Bring your own camera and a project or two, and learn the basics of lighting, depth of field, styling, and common fiber photography problems like capturing true color, capturing stitch definition, and photographing lace.We will also learn how to make a light box at home, cheap! No prior knowledge of photography necessary. The emphasis will be getting the best possible shots using your camera. Franklin is Hilarious! With a capital 'h'. He is also VERY knowledgeable about photography. He used to be a photgrapher in a former life and is able to dumb a lot of down for those of us who are not pros. We learned a lot about Lighting – color/angles/intensity, depth of field, and shutter speed. How to get off using the "Dummy Wheel" as one lady called it and how to set these settings for ourselves. Like I said – technical, but he didn't go off a topic until everyone understood it. And easy enough for everyone to grasp. And you don't have to have a fancy camera (I used my iphone for the pics below). He also had a light box setup for us to play with. I need one of these. Since I live in a condo on the second floor with an eastern window, I don't get much natural light to take pics. Luckily they are cheap and easy to make. Here is a hat I've been w orking on in secret. Please forgive the wonkiness – I didn't have anything to make it stand up properly. But you can see the difference that background and light have on it. The black background utilized a reflective material on the left side, which you can see a bit when you make the image bigger. The white background is in the lightbox. Learn how to knit and purl backward (i.e., not turning the work) and how to apply this technique to working an applied edging. Students will practice knitting and purling backward, then apply an edging with an incrediblemitered corner. 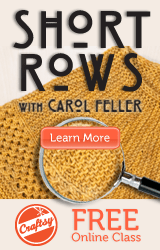 Also great for entrlac, bobbles, short rows,mitered squares, and anything else you can think of! Candace is also Hilarious. She definately has a sense of humor! I learned how to "smooth" and "bump" backwards. She doesn't like to use the terms knit and purl because people tend to think a bit differentely when they use those terms and there is confusion. So, any way, smoothing is when you are looking at the right side and it's all knitting stitches. So, it's the smooth side. I think you can all figure out the bump side. She had us come with a swatch so that we could practice adding an applied boarder to to it. Wish I would have known that since I made a swatch and added a garter stitch boarder to it while I knit it. Brilliant. That's ok, just made it look interesting. types of sweater that can be knit from the top down and will explore ways to get the best fit in a top-down sweater.We will look at shape of the body and different ways to work yokes that mimic this shape. Yoke styles covered will include: compound raglans; round yoke, saddle shoulders, and set-in sleeves—and we will discuss the calculations involved in creating each. During the class knitters will work a mini swatch version of a seamless set-in sleeve from the top down and should leave with the confidence to create their own top-down sweater with any style of yoke. Let's be honest here. I've been out of the knitting world for some time, so I had no clue who Ysolda is. I took this class solely based on it's description. When I got there people were gushing over her. So, I looked through her Little Red in the City book that someone had brought along to be autographed. It looked like there was a lot of good information about fit in it, so I ordered it while I was in class. Now, if you are interested in it, you better go order it on Ravelry since they are the main seller of this book. One more note on the book – she sells it with an electronic copy so you can print off the patterns or put them on your iPhone/iPad. I think ALL publishers should do this!!! Back to the class – She really knows her stuff. She walked us through an example of how to figure out raglan increases to make a top down raglan fit better. She knew what she was doing, but she didn't have an example already worked out for us. As she was going through the process, she tended to change numbers here and there making it difficult to follow. At least we seem to have pretty detailed handouts. It was a good class, but to be clear, this was only for YOLKs of sweaters. No other shaping was discussed. If you are looking for a complete how to create a sweater class, this is not it. I think my trip was good and worth it. I may consider volunteering for the Chicago since I don't plan on taking too many classes or shoppnig too much more. Because I have a lot more yarn these days and I am a responsible adult!